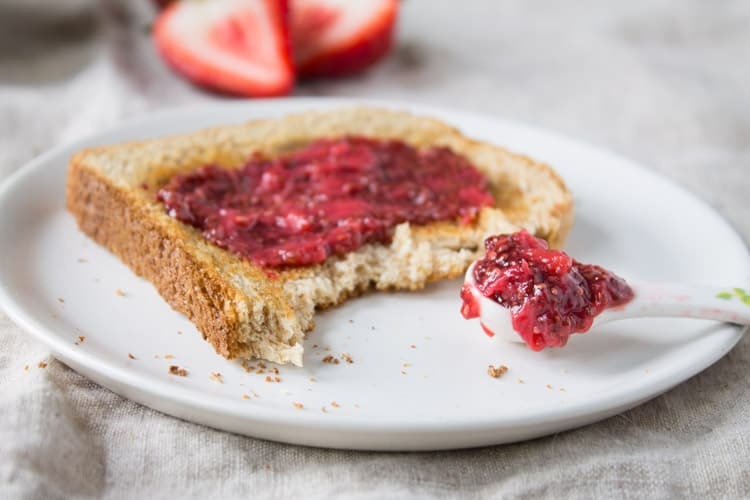 A thick jam packed with antioxidants, fiber, and omega3s, strawberry chia jam is absolutely delicious paired with peanut butter on toast! Strawberry season is here and I’m jonesin for some strawberry picking action! It seems the past couple years I’ve had the best intentions to go strawberry picking, I blink, and then June is over, and so are the strawbs. I’d make a proclamation right here and now that this year is going to be different with all of you readers as my witness, but it ain’t gonna happen. Steve’s traveling next weekend and the weekend after that and then I leave for (gasp!) Europe. I can’t believe it’s so soon! I have this thing where I can only focus on one week ahead at a time and everything else seems so far into the future in when reality it’s going to sneak up on me and bite me in the you know what. I digress. My point being, Europe soon. Strawberry picking not in my near future. But that won’t stop me from making strawberry deliciousness. 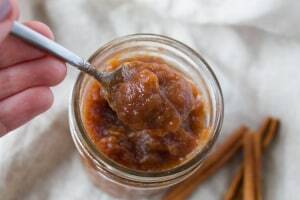 This month’s Recipe Redux is all about DIY kitchen essentials, i.e. 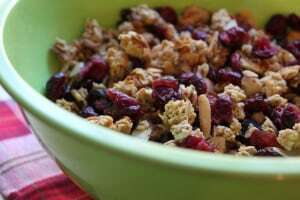 those items you used to purchase from the grocery store until you realized they were more delicious, healthier, and cost efficient when you make them from scratch at home. The first thing that came to mind is vegetable broth! Last year, a friend of mine shared with me that she freezes all of her leftover vegetable scraps and once she collects enough, boils them with water to make homemade veg stock. I’ve been making my own ever since. Mostly because I hate food waste and like to repurpose ALL THE THINGS LEFTOVER. 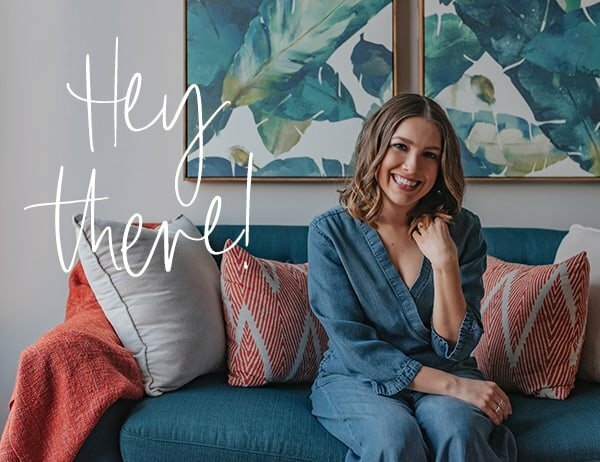 But it’s spring now and I’m kind of over eating soup for breakfast, lunch, and dinner like I did this past winter so I’m not going to share that with you now, but maybe later this year! What I am going to share with you now is a DIY jam that’s SO easy to make, you’ll wonder why you ever bought jam in the first place. And yes, it includes strawberries!! 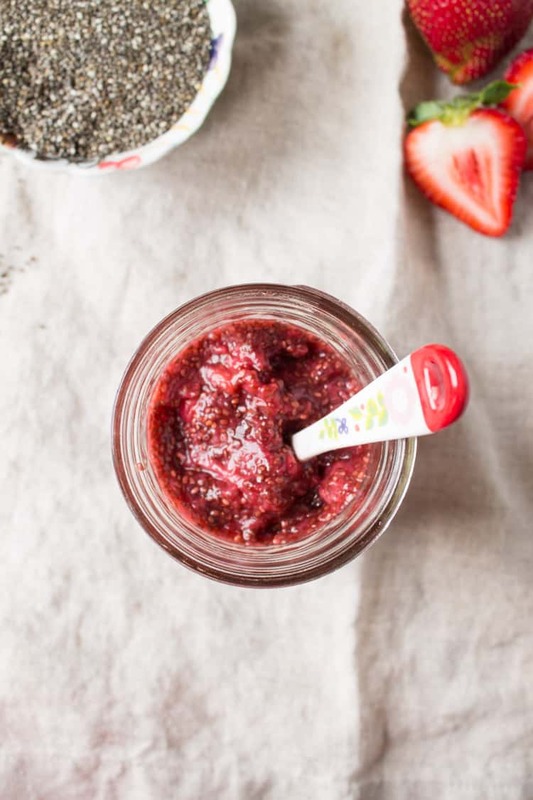 Strawberry chia jam is nothing novel. 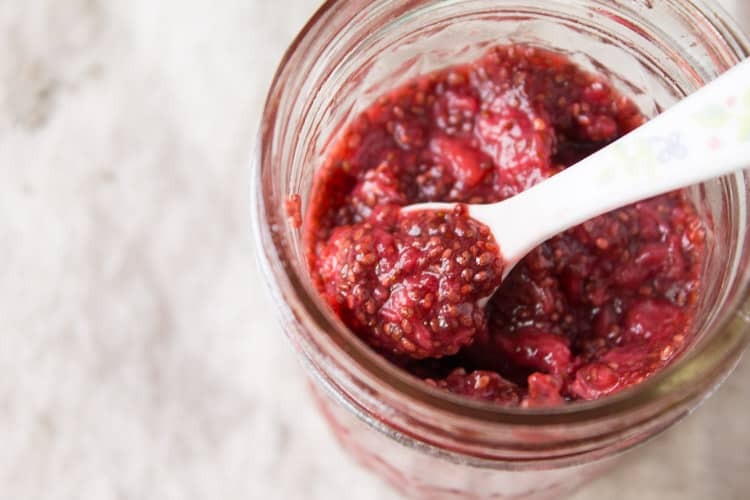 I’ve been seeing chia jams all over the place and in fact have shared some favorites on past Foodie Dietitian Friday Favorites where I’ve vowed to try it for myself. Well, that time is here. I finally gave it a whirl and LOVE LOVE LOVE it. 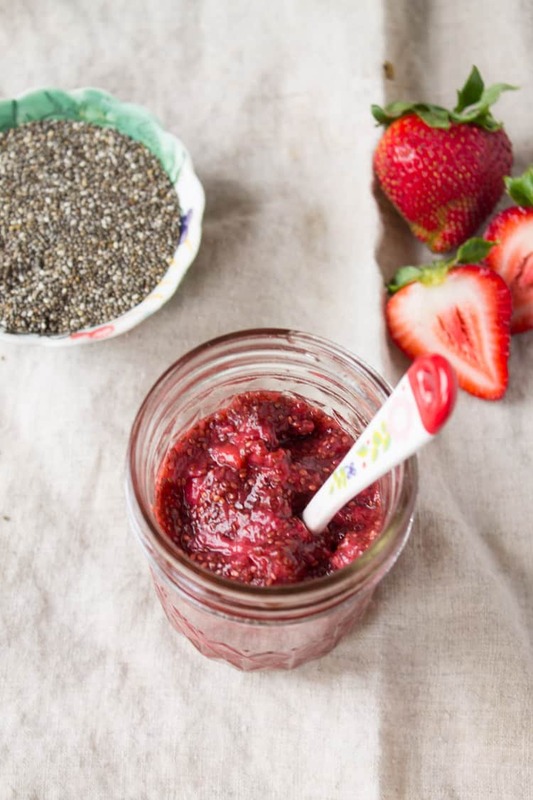 The chia naturally helps the fruit thicken and adds a nutritional punch of fiber, omega 3s and protein. A nutritious jam? I’ll take it. And I added just a couple tablespoons of agave nectar for sweetness without it being overly sweet. I mean strawberries are sweet enough as is, amiright? Add strawberries and agave to a medium pot and cook over medium heat for approximately 10 minutes, or until strawberries are cooked down. Mash the strawberries with a fork or potato masher to create a sauce-like consistency. Cook down for an additional 5 minutes. Remove from heat. Stir in chia seeds and let sit to thicken and cool, about 15-20 minutes. 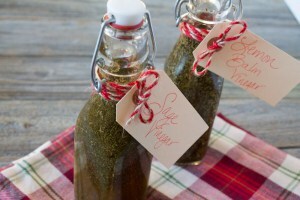 Pour into a glass jar and store in the refrigerator. Spread this jam on top of some toast with peanut butter and you’re read to roll. And take a gander at what the other Reduxers are making at home! Great looking jam, perfect for summer! 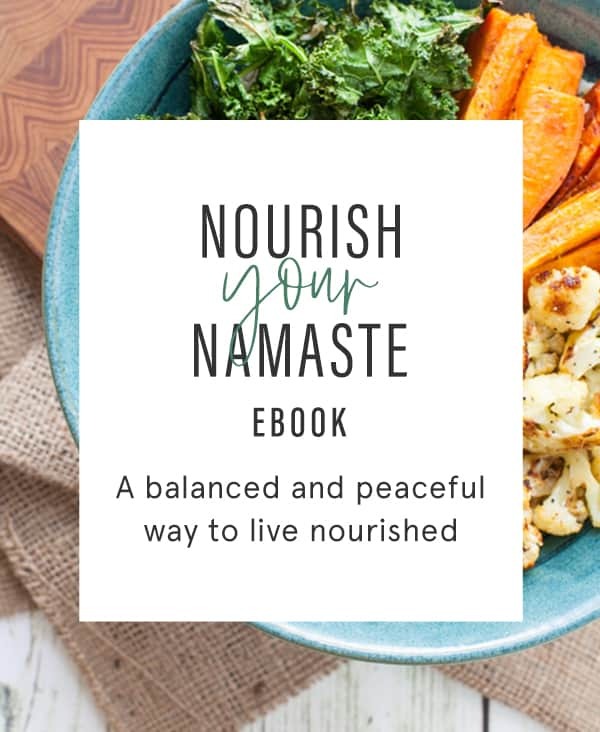 This sounds so delicious and easy to make! Yum! 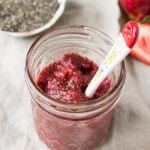 I just love chia seeds and what a great way to use those yummy summer strawberries! Hi! For about how long would you say this will hold up in the fridge for? Thank you! 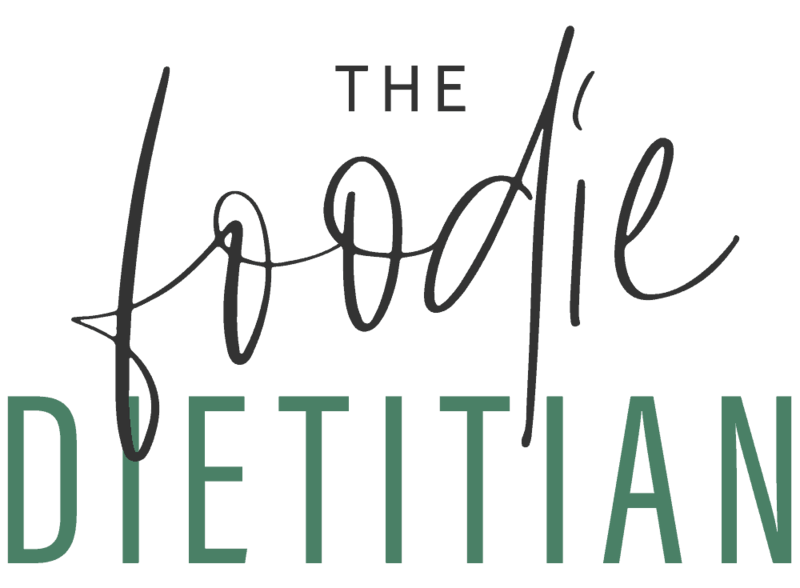 So easy to make and a super delish way to get chia into your diet. So excited for your for your European trip! I made my first strawberry jam last summer and was surprised by how easy it was to make. I love, love, love the addition of the chia seeds here. Thanks, Allie! They’re the perfect little nutrition punch and thicken the jam so well! Thanks, Michaela! Local honey sounds delicious. Enjoy! I hope you are going somewhere fun in Europe. I am heading to England, but I do live in Europe. I love the jam! Strawberry season is just starting in Germany and it’s a big deal. Have fun! Thanks, Rachel! It was my first time trying it but I plan to make more this summer!